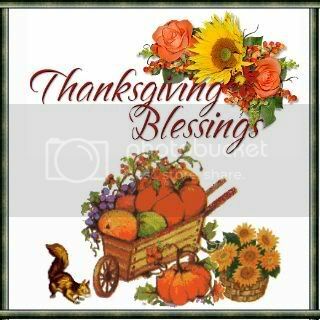 I know it's not until tomorrow but let me just greet those who are in the US a very happy Thanksgiving a day early. Our thanksgiving will probably be spent here at home. I already have the 'bird' thawed out. I just need to clean it and pop it in the oven. Wish me luck on that. As usual the little one is extra excited because it's another 'celebration'. She actually made a list of her own on what she wants for Thanksgiving....but we're not getting most of it [she put 'chili' in her list....why oh why?]. I am planning in making peanut butter pie and a pumpkin pie. Not quite sure what to make for the sides though. I'll probably need to do some research. Btw, thanks much for those who wished our little one to get well.....she is well already. She's more careful now on how she eats. You know....that she has to actually chew her food before swallowing it. Anyway, I have to start that 'research' already. Wish me luck again. i think you have succeeded in your research na, LOL...THAT WAS. Add me in your blog,i am waiting here for a good conversation..Bye takecare.